A Girl's to Fitting in Fitness by Erin Whitehead & Jennipher Walters. Review: Did you know that becoming fit will help you relieve stress? 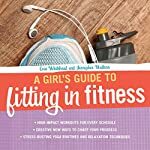 Well, if you don't believe me, read Chapter 8 in the amazing nonfiction book, A Girl's Guide to Fitting in Fitness by Erin Whitehead and Jennipher Walters. This book will help you become the healthy person you've always wanted to be while having some fun! A Girl's Guide to Fitting in Fitness has many chapters. This first chapter, Why Getting Fit Matters, tells you the importance of why you need to get in shape. Basics of a Fitness Plan informs you on the fundamentals of your workout procedure. Eating Well mentions the things you should and shouldn't be eating while trying to become fit. You will find healthy breakfasts and morning exercise routines in chapter Waking Up to Exercise. Being Fit at School talks about joining a sports team at your school. On Weekends & During the Summer refers to how it is important to still workout and eat healthy but make the most of that free time. Next-level Fitness mentions how to become even healthier and slimmer by doing such as setting smart goals, joining a gym and doing high-intensity interval training once in a while. Stress-Busting Techniques mentions many effective methods to get rid of stress. This book includes all aspects of fitness. In my opinion, A Girl's Guide to Fitting in Fitness is a useful source of information on getting real results. I recommend this 5-star book to girls ages 13-18 looking to get fit. My favorite chapter of this book is Stress-Busting Techniques because it definitely has an impact on my stress. I am very fond of this book because it gives me a lot of real-working techniques to get me fit and healthy. In summary, A Girl's Guide to Fitting in Fitness is unquestionably my favorite guide to working out! Review written by Angelina (6th grade student). We would like to thank Zest Books for providing a copy of A Girl's to Fitting in Fitness for this review. Have you read A Girl's to Fitting in Fitness? How would you rate it?